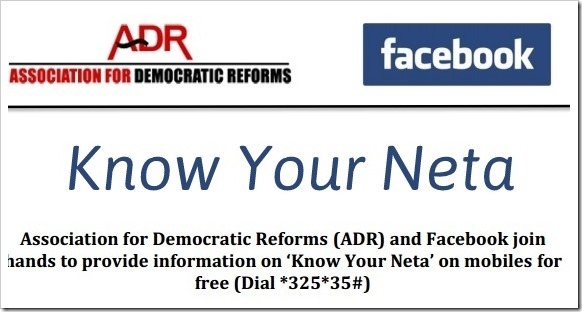 Facebook & ADR Join Hands To Reveal Background Of Indian Politicians On Mobile For Free! You would be surprised to know but out of 4807 sitting MPs and MLAs all over India, 1460 or 30% have criminal cases pending against them. And this information is something which these esteemed MPs and MLAs have themselves revealed to the Election Commission of India while filing their election papers. And then, there are some politicians who have won elections while serving their jail term! Isn’t this something we should be ashamed of? Association of Democratic Reforms (ADR) is an Indian civil society which is hell bent on changing this current scenario by bringing in more transparency within the clandestine ecosystem of Indian politics, which is extremely corrupted with criminals and history-sheeters calling the shot. ADR has been founded by a group of IIM professors and now is supported by a huge network of NGOs spread all over India. One of the biggest achievements of ADR has been implementation of its plea for greater disclosure from election candidates regarding their wealth and assets. Although the Government of India tried to suppress this law, Election Commission eventually accepted it, and since 2003, the process has been implemented. Some other achievements of ADR include acceptance of their suggestion for providing information about Income Tax returns of political parties and unlocking information about Registers of Member’s Interests. ADR has now roped in Facebook to bring in more information and more transparency within the overall political landscape. ADR has realized that technology can be utilized in an optimal manner to dig out secret information which our leaders and politicians are not willing to disclose. With this new initiative, aptly called “Know Your Neta”, general public can access complete information about any candidate who is going to fight the next general elections and assembly level elections. The information which can be accessed include financial details, criminal background, professional qualifications, job experience etc. When crucial data such as these are easily available to the general public, then they can surely make an informed and logical decision while giving their valuable votes. In a smart move by ADR and Facebook, you don’t need access to Internet to have this information. Using Facebook’s technological assistance, ADR will rely on USSD protocol to deliver the information. USSD is a platform which is used by almost every GSM provider to create a 2-way communication which is richer than SMS and lot cheaper than Internet usage charges. Regarding this initiative, Ankhi Das, Facebook India Director of Public Policy said, “Over 82 million Indian citizens access Facebook regularly and an increasing number of users access the platform on mobile. Together with ADR…we hope to make information more readily available to users about the antecedents and performance of political candidates”. To get information about any political candidate, users need to dial #325# from their mobile, login to their Facebook account and then choose Election Menu (option 6). Alternatively, users can also dial *325*35# and connect directly with this information stream. Only we can change our world; and this brilliant initiative by ADR and Facebook will definitely help us in achieving that. Please, use this service and make an informed decision this political season. Interesting article Mohul. We always think about change in the society. These people trying to bring some changes in society with technology. We must appreciate them for their initiation. ADR and Facebook we are with you for better society. Best compliments from http://www.syberplace.com.